The following instructions should only be used if you have read and complied with the Delta Kite Instructions, are using a hardwood or carbon fiber spreader cross spar of the correct length and have checked that none of the internal spars of your kite are broken. Paul's Fishing Kites Super Kite and Nighthawk Delta Kites are renown as being one of the best and most stable strong wind kites in the world. These two kites are so reliable they are becoming very popular for kite aerial photography (KAP) as well as the first choice for serious kite fishers. The remote controlled camera gear used in Kite aerial photography is very expensive and fragile so anything that can be done to further improve the kites performance, stability and pull should be done. Kite fishers who ensure their kites are well tuned will find their kites are always the first ones up in light winds and the last to come down in gale force winds. A perfectly tuned Delta Kite should fly straight downwind in everything from a steady breeze to gale force winds - and pull consistently for as long as the wind speed exceeds the natural gliding speed of the kite. The natural gliding speed is the speed the delta kite and it's load would glide forward at in no wind if released from a high place, minus the drag created by the kites load. 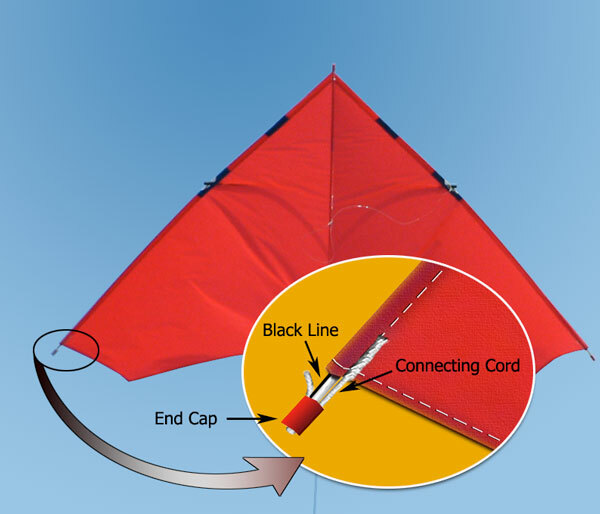 Increasing drag (eg: using a lightweight shopping bag as a drogue) or reducing load (such as using a lighter kiteline) will both make the kite fly in lighter winds. If the kite is slightly out of tune it will need stronger wind and develop less pull than it should. Out of tune kites are easy to spot as they will fly with a consistent bias either to the left or right. The further out of tune the kite is the more it will fly off the wind. While our kites are constructed to be extremely well balanced and tuned when new, and are guaranteed to fly in their wind range, as the kite ages several things can cause a bias to creep in. Does My Kite Need Tuning? If the kite is flying from left to right evenly hunting the wind from one side to the other it merely indicates an erractic wind or turbulence and no action is required. If the kite has a consistent bias to one side then correcting it will vastly improve performance. If the kite has a consistent bias the most likely cause is that one of the spars has rotated. This can happen if the wing spar is inadvertently twisted while fitting and removing the cross spar (spreader). Usually twisting only happens if the spar is cut too long. Is very easy to correct the twist. Above: A correctly assembled and aligned wing spar. Ensure the black vertical line on both fiberglass wing spars is facing outwards and the connecting cord lays up the opposite side. To correct the lay of the spar hold the cross spar locator tube and twist the wing spar. 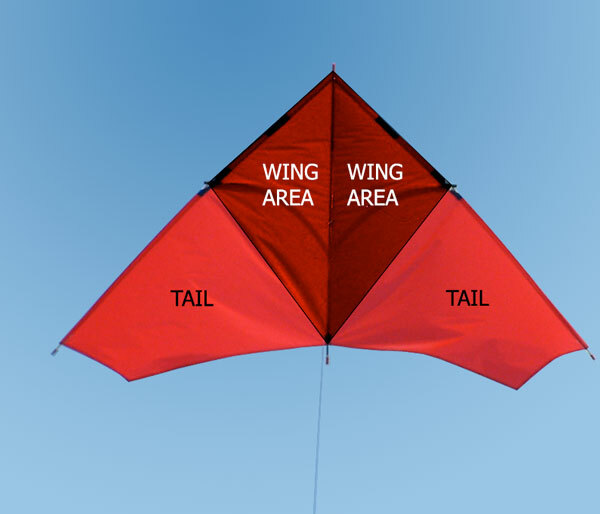 Only if the points above are checked and corrected, and the kite still has a persistent bias to one side or the other, should the following techniques be tried. Delta kites have two areas of importance to flight. 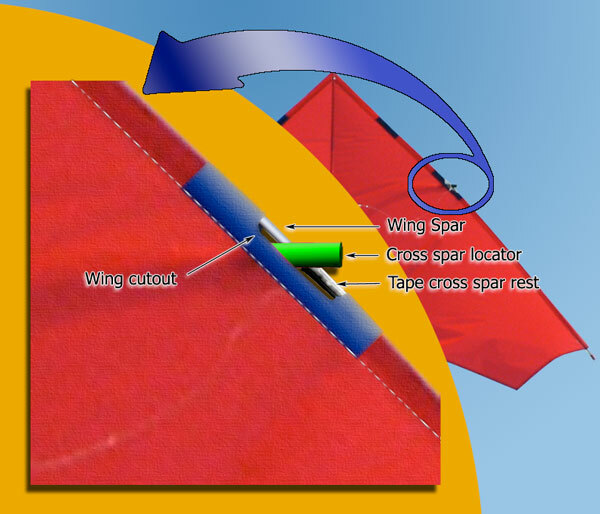 The diamond shape formed in the middle of the kite (shaded area) is the effective wing area which develops the pull and lift. The rest of the area of the kite skin provides stability much like the tail of other kites. If the wing area is not balanced the kite will fly towards the side which offers the least resistance. If one wing area is bigger the kite will have a bias towards the opposite side. 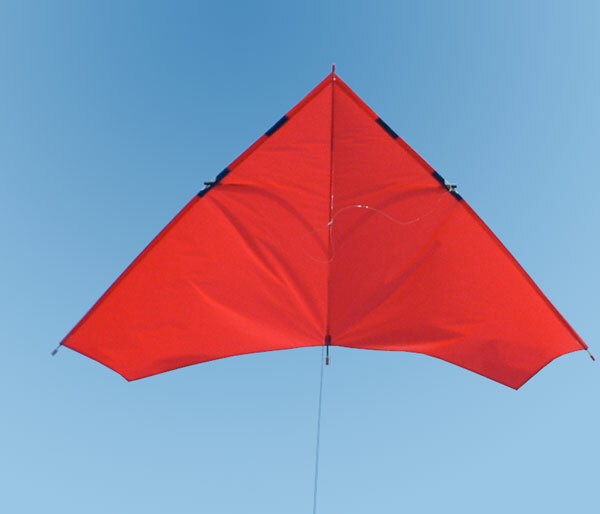 The kite wing and cross spars are held in place by the red plastic cap on the wing tip catching on a knot in the cord which is sewn to the kite skin. Altering the position of the knot in the cord allows you to enlarge or reduce the size of each wing until the kite flys perfectly down wind. As you remove the cap at the end of the wing you will note that the knot sits squarely on the end of the wing tip. Note: When removing or replacing the end caps run hot water over the cap first to soften the plastic. For this explanation assume the kite in the diagram below has a bias to the right when looking up at the kite. If your kite is flying left simply do the adjustments to the opposite side. To correct a right hand bias you can loosen the knot on the left hand side and retighten it so the knot is 10mm to 15mm closer to the kite skin. This lifts the cross spar locator up towards the nose of the kite and shrinks the size of the left hand wing area and reduces it's ability to drive the kite to the right. Or you can loosen the knot on the right hand side and re-tighten it so the knot is 10mm to 15mm further from the kite skin. This lowers the cross spar locator towards the wing tip of the kite and increases the size of the right hand wing area and increases it's ability to drive the kite to the left and correct the right hand bias. Altering both sides 5mm - one side shorter the other longer is more effective than doing a 10mm adjustment on only one side. The kite will be more stable. Try to avoid adjustments that force the spar locater to the extreme top or bottom of the wing cut out as this will distort the kite skin. A perfectly tuned delta fishing kite will fly in lighter and much stronger winds than the same kite with a slight bias to one side. It will also deliver much more pull and lift which is exactly what everyone wants for fishing or photography. The article above is a response to a question from Michael Layefsky regarding fine tuning and trouble shooting flight issues with delta kites. His reply is posted below. That is an outstanding answer to my tuning questions! I wish all the questions that pop up in my head could have such well thought out responses with accompanying diagrams. After reading the instructions and inspecting my Nighthawk, I did find that one of the kite's spars was slightly rotated. The winds are fairly light here most days, but hopefully I'll have a chance to test the Nighthawk soon and make further adjustments, if necessary. 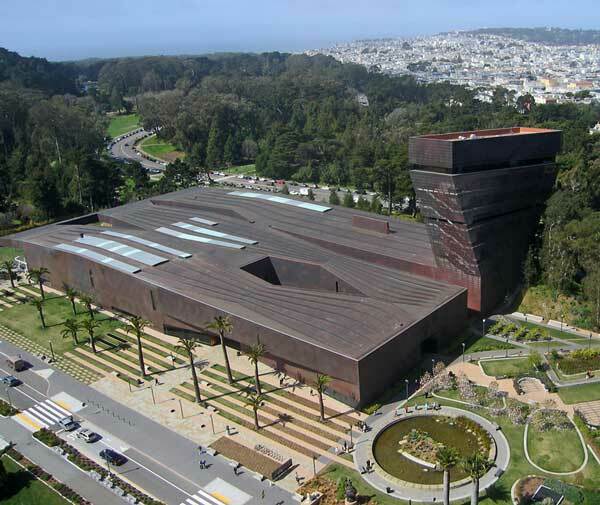 I'll report back when I have the kite flying straighter, or when I need additional advice. I'd be happy for you to use one of my KAP photos for the article. Thanks again for taking the time to assemble such a complete response to my questions.